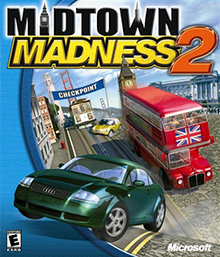 Midtown Madness 2 is a free roam racing/arcade sequel to Midtown Madness, part of the Midtown Madness series, developed by Angel Studios and published by Microsoft, which features a range of vehicles that can be driven around London and San Francisco. The game features Blitz, Checkpoint, Circuit, and Cruise modes, which are all derived from the original Midtown Madness game. Winning Blitz, Checkpoint and Circuit races allows the player to access unlockables, and the Cruise mode lets the player roam freely around the two open world recreations of London and San Francisco. A Crash Course can be completed in each of the cities. The Cab Driving School in London follows an extremist view of a London cab driver, where a player must complete objectives in a London cab. The Stunt Driver course in San Francisco allows the player to gain experience in stunt driving for a Hollywood movie, using the Ford Mustang Fastback. Players can change the visual appearance of the game before starting a race, such as the weather and time of day. Additionally, the frequency of how many cops spawn around the city can be modified, along with the amount of traffic and pedestrians. In Cruise Mode, this can change where the player starts off. Every race or cruise begins with a commentator introducing the course. These commentators would also be heard at the end of a race saying something that depends on the player's position upon finishing. The commentators would be different for each race, and they are different for each of the two cities. The commentators can be turned off. One of the game's most entertaining aspects is its humor; for example, the new age retro hippie in San Francisco singing out-off-tune variation of John Lennon song Give Peace a Chance. In most races and Cruise mode, people in cars and pedestrians can yell comments at players in different languages. Support for multiplayer gaming via IP address, serial cable, and analogue modem is built-in. Additionally, the game's multiplayer menu includes a link to the MSN Gaming Zone, which offered Midtown Madness 2 lobbies until 19 June 2006. Similar online gaming sites still support multiplayer gaming and also through instant messenger clients. Multiplayer clients use Midtown Madness 2's built-in DirectPlay support to launch and manage multiplayer sessions. Midtown Madness 2 was met with positive reception, and has an aggregate score of 79.03% on GameRankings, and on Metacritic an aggregate score of 78 out of 100. ^ a b "Midtown Madness 2 for PC". GameRankings. Archived from the original on September 9, 2014. Retrieved September 8, 2014. ^ a b "Midtown Madness 2 for PC Reviews". Metacritic. Archived from the original on December 10, 2014. Retrieved September 8, 2014. ^ Couper, Chris. "Midtown Madness 2 - Review". AllGame. Archived from the original on November 15, 2014. Retrieved November 23, 2014. ^ Edge staff (December 2000). "Midtown Madness 2". Edge (91). ^ Bramwell, Tom (October 5, 2000). "Midtown Madness 2". Eurogamer. Archived from the original on September 9, 2014. Retrieved September 8, 2014. ^ Brogger, Kristian (December 2000). "Midtown Madness 2". Game Informer (92): 134. ^ Wight, Brian (September 29, 2000). "Midtown Madness 2 Review for PC on GamePro.com". GamePro. Archived from the original on February 9, 2005. Retrieved September 8, 2014. ^ Sanders, Shawn (September 2000). "Midtown Madness Review". Game Revolution. Archived from the original on September 9, 2014. Retrieved September 8, 2014. ^ Poole, Stephen (September 25, 2000). "Midtown Madness 2 Review". GameSpot. Archived from the original on June 12, 2014. Retrieved September 8, 2014. ^ Accardo, Sal (November 2000). "Midtown Madness 2". GameSpy. Archived from the original on January 12, 2005. Retrieved September 8, 2014. ^ Lopez, Vincent (September 28, 2000). "Midtown Madness 2". IGN. Archived from the original on September 9, 2014. Retrieved September 8, 2014. ^ "Midtown Madness 2". PC Gamer: 168. December 2000.